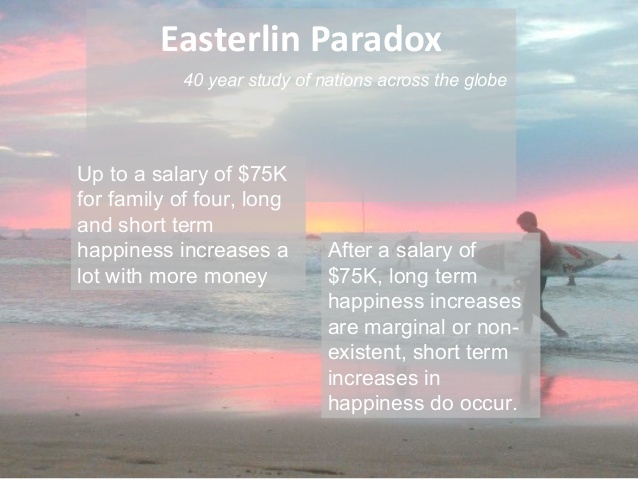 I’ve been doing some training (as counsellors always do a lot of additional training every year) and came across something called the Easterlin Paradox. It may be something you already know about but the name was new to me. The basic premise is that while some money makes you happier, lots of it doesn’t increase your long term happiness. There are lots of fancy graphs online if you are interested in those but I found it gave me something to reflect on. What makes me happy? What makes you happy? It may be different for each of us, but how often do we really take the time to explore it? Giving ourselves the gift of time for self-reflection is such a valuable thing, possibly one of the greatest gifts we can actually give ourselves. Thats one of the things therapy gives us, the space for this self-reflection. To explore our values, what we really want out of life, what enhances our well-being and allows us to live a fulfilled – and happy life. Why not give yourself that gift? Have you heard of the term reflective practice? For counsellors it is incredibly important and plays a big part of our work. As counsellors we have duty to provide the best service possible to our clients. You trust us with your inner thoughts and feelings, we have to respect that by ensuring that we give you the best of ourselves. We have a number of ways to do that. The first comes during our initial training. We explore our own history in detail and attempt to identify our sore spots, the parts of ourselves that are difficult to revisit and cause us pain. This includes our prejudices and why we want to be counsellors. But as we are only human we have to keep checking into these things and watching out for new things that may come up in our lives. If a client brings something into a session that we can identify with but haven’t worked on in ourselves that will block the client from being able to deal with it. For example if we have had a bereavement that we are still struggling with we would find it very hard to stay in the clients frame of reference. So we spend a lot of time reflecting on our practice and the sessions we have with clients to pick up any areas we need to develop. This can start with some initial reflections after each season but we also have supervision. We are duty bound to our professional organisations to have a minimum of 1.5 hours a month supervision. During this time we look in detail at some of the things coming up in our work to ensure the client is getting the best service we can provide. This can be one to one with a supervisor or in a group environment to get different perspectives. Our clients anonymity is still held in this space, by that I mean that although we may discuss some of the things they bring to sessions they are not identifiable. Confidentially is still covered. We also engage in a great deal of training each year to ensure we keep are professional knowledge up to date and we are working on the areas that we feel we need to develop. We identify these from our own reflections, from the sort of themes our clients bring and feedback both from clients and those we have supervision with. All of this effort put into reflective practice means that as counsellors, we are working safely and within our competency levels. It also means that we can identify our limits and recognise when self care is required. When it came to choosing where to set up an office for my private practice near London Bridge seemed an obvious location to me. I knew it would be convenient both for clients who live in the area but also those who work locally and commute through the station, both tube and overground. I was lucky enough to secure premises that I have for Friday afternoon and evening on Borough High street. Not only are they only a few minutes walk from London Bridge, Borough tube is also very close. Even more conveniently there is a bus stop right outside the building. Stop H heading south from London Bridge towards the Elephant currently has bus routes 21, 35, 40, 47, 78, 133, 343, C10 stopping at it due to the diversions in place. The stop for people traveling from the opposite direction is just over the road. As well as the convenience for clients to travel to therapy, the area offers lots of coffee shops. These can be useful if you arrive early, or need some time afterwards to process the session you have had. Why are people not seeking help? I see such conflicted views from people seeking help. Some people seem to feel they don’t really have a problem but they are just checking things out (this usually means there is a problem but they aren’t ready to acknowledge it as such), others know they have a problem but don’t think it is bad enough to warrant much attention. Other people know there is a lot going on, but for one reason or another they are just not ready to commit the time it takes to work on it and others seem to believe it can all be solved in just one session. All of these experience show how confusing it can be be when people do reach out for counselling, the article below explores more about those I never hear from. The bottom line is there is still a lot of misunderstanding about what counselling is and what it can achieve. It is hard work. It can at times be very upsetting and mean revisiting painful emotions and experiences in our life. By doing that we can view them from a different perspective with an impartial person accompanying the journey. This process can take a short time or a long time, it depends on so many factors. But if there is something going on for you that you are not happy with, then what is holding you back from trying to change it? This is an interesting article, it shows two sides of human nature and how that is expressed on the internet. The need for love and connection vs the need by others to exploit that. There is a lot of work being done recently to promote mental health support – but there is still a long way to go. Check out this article for more details. This podcast from the BBC last year details some of the pressures young people are having when trying to get a degree and the reasons they drop out. I was encouraged that those who were experiencing mental health issues and were able to engage with the university counselling services did find them useful. Sadly it is disappointing that accessing that wasn’t always easy. Waiting lists or not even know it was available delayed their treatment. I wish everyone starting their university career this month all the very best and if you need support that you can access it. This is a really interesting article on the history of some different forms of therapy and how CBT has become most common. My modality, the person centred approached is part of the humanistic type of therapy and isn’t really mentions much. However, I think its worth noting that it sits between the psychodynamic and cognitive approaches being discussed. I absolutely believe that all three approaches have there place, just as the therapist will be drawn to one type, so to will be the client if they have a choice. When I first explored training, the person centred approach resonated with me and that is why I chose a course based on this approach. I urge everyone who is looking to find a counsellor to do some independent reading on the types of therapy available.